Really, it’s just the one warlock and shadow, but you takes what you gets. Don't you wish your life was just a little more magical? Do you sometimes peer out from your office into the hallway just hoping that a wizened old man is on the verge of slinging a spell? One last question: How do you feel about physical objects blocking beams of light? 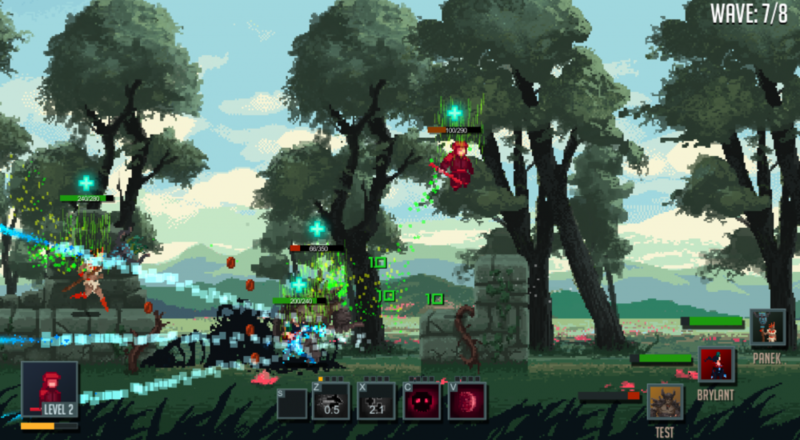 Warlocks vs Shadows, a four player co-op game styled in the vein of Risk of Rain, aims to introduce just a little more magic and darkness to the lives of PC gamers the world round. It can currently be found in the misty depths of Steam's Early Access program and, as such, has been dutifully releasing updates since its release in March. This latest update, hot off the Polish presses, adds the Blood Mage, Iezabel, as a playable character. I haven't had a chance to use them yet, but I imagine their powers consist of using blood as an arcane implement and looking at your veins super creepy-like. In addition to Iezabel, the developers also added a new level, the Shadow World. That's not all, of course. Level selection, voice-overs, and a ton of new sound effects were also introduced to the game, along with the usual assortment of balance tweaks and bug fixes. You can check out the full list of changes here. Warlocks vs Shadows, which offers both local and online co-op, is currently available on PC. However, co-developers Frozen District and One More Level aim to give the game a full release on the Xbox One, PS4, PS Vita, and Wii U in the third quarter of this year. Page created in 0.7607 seconds.